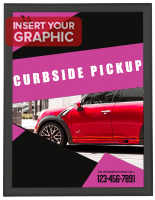 This Heavy-Duty Sign Supply Displays Outdoors and Features a Lock to Protect Graphics! This Sign Making Equpment is Perfect for Community Center Displays! Order Before 1 p.m. For Same Day Shipping! 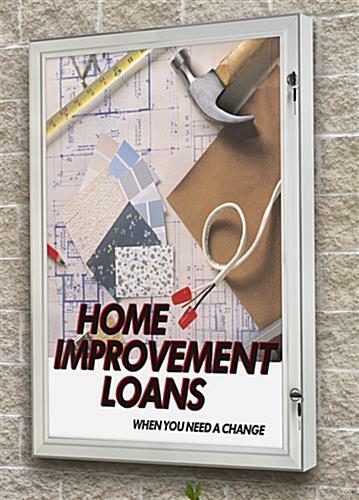 Rubber gaskets seal moisture out of the swing open poster boards. 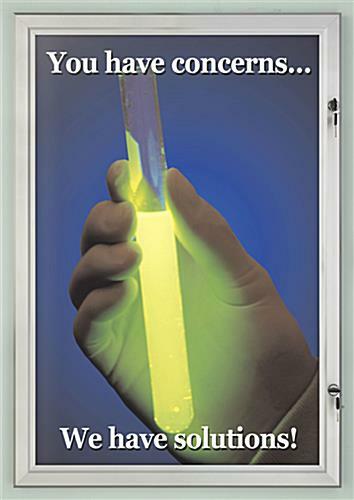 Silver anodized aluminum frame has a 1-3/4"w profile to enhance prints. 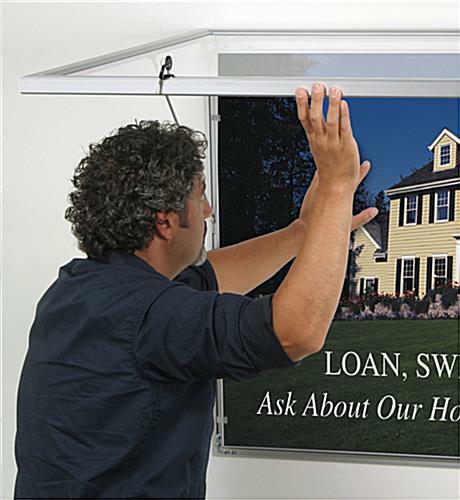 Swing open poster boards lock to ensure the frame stays securely closed. 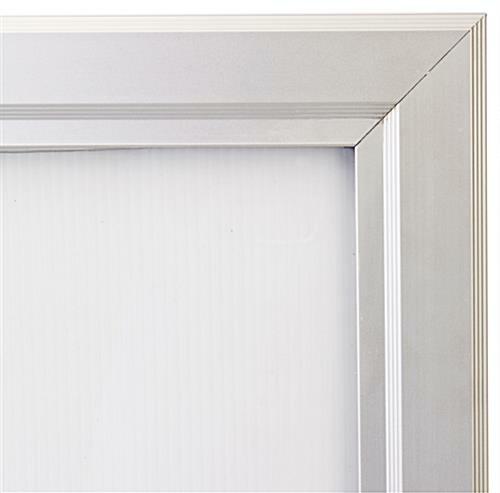 Frames come with hardware for mounting in landscape or portrait orientation. The front panel of this product fully encapsulates the portion of the exhibit attached to the wall. This rainproof sign supply for sale has rubber gaskets, which overlap with all four edges of the panel when in the closed position. 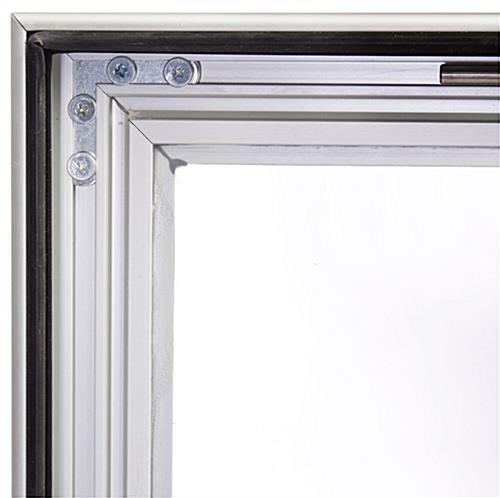 The rubber climate stripping prevents moisture from penetrating the encased aluminum frame. The non-reflective, hard acrylic lens is climate resistant as well, keeping signs safe from water, dust, dirt, and fingerprints. The swing open sign supply that has rubber gaskets is constructed from aluminum for sturdiness. 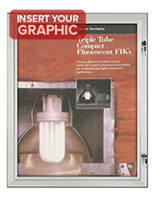 These showcases are not difficult to affix, as the aluminum composition has a low weight of only 12 lbs. While the design of each and every aluminum frame incorporates durable climate tolerant characteristics, the cost of these products remains extremely inexpensive. In truth, this sign supply is among the most reasonably priced techniques of promoting sign outdoors. This aluminum swing open sign supply, also recognized as outdoor rated poster frame, are great for putting up media content or menus outside! 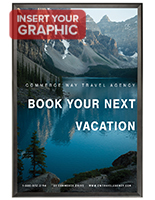 A user-friendly design, water impervious engineering, and inexpensive cost make this product one of the greatest options available online for exhibiting signs outdoors. The adaptable sign supply for mounting signage outside swings, which means putting in new 24" x 36" images is simple. Arms on the interior of the product pivot out to keep the frame open when putting in new signs. Four acrylic snaps on the corrugated acrylic backer hold 24" x 36" safely in position. This silver swing open sign supply has two locks that make certain the product does not accidentally open. 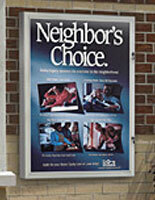 The fact this enclosed sign frame locks makes it far safer than snap frames or slide-in showcases. The locks also preclude destruction of your graphics. 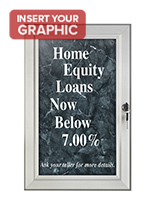 This sign supply, swing open visual graphic boards that lock, include a set of four (4) screws and anchors for affixing the poster frame in landscape or portrait orientation. Overall: 26-3/4" x 38-3/4" x 1-1/4"
Viewable Area: 23-1/4" x 35-1/8"
26.8" x 38.8" x 1.3"